There are many stages in the production of our premium spirits before they reach the consumer. We know that many of the environmental and social impacts associated with our business are in our supply chain, and we try to reduce these impacts at all stages of our product lifecycle. Sourcing ingredients from carefully selected suppliers is the first step of producing our premium spirits. We value our partners in the supply chain and work with them to achieve the highest standards in their own operations. Agricultural ingredients are extracted or fermented at manufacturing sites following long-established recipes to create our six global brands and our strong portfolio of other brands. We aim to establish projects that will deliver continual gains in our environmental performance, particularly improvements related to energy and water use, greenhouse gas emissions, waste and water quality. Our success is built on our outstanding people, and we need to ensure they are safe at work and appropriate labor standards are maintained. Establishing a safety culture is essential to delivering an accident-free workplace. Aging and bottling take place at sites around the world, where finishing touches are put on our products. When complete, our products are shipped to customers through several distribution channels. Our packaging consists mainly of glass and cardboard, with small amounts of plastic and metal. 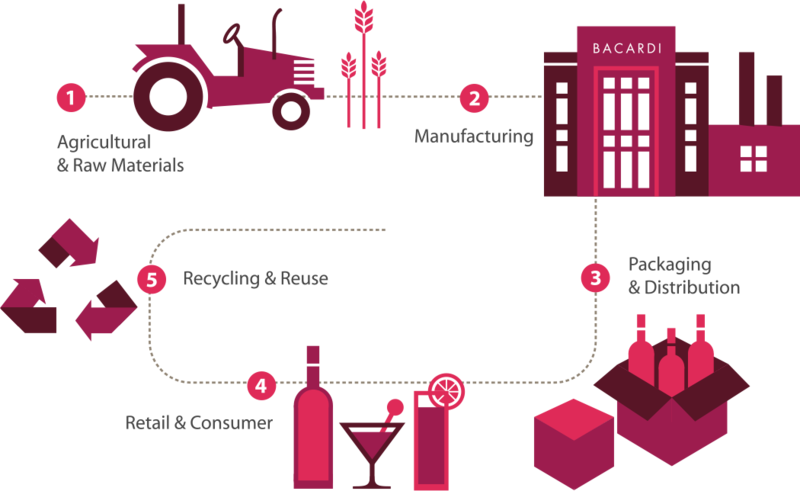 Around 50% of the carbon emissions from our value chain come from the manufacture of glass. Reducing the weight of our bottles and increasing the use of recycled glass help to reduce this. Our customers are retailers who distribute our brands through a number of channels, including supermarkets, restaurants, hotels and bars. These customers sell our products to consumers, who enjoy our brands. The vast majority of consumers drink alcohol responsibly and in moderation. We contribute to reducing the potential risk of irresponsible or excessive consumption by ensuring we adhere to responsible marketing codes and providing an influential voice in raising awareness of responsible drinking through our engagements with industry bodies and consumers. Our products are sold to customers and consumers in packaging that will subsequently be disposed. Furthermore, our manufacturing process generates waste. Recycling is an essential way to reduce the impact of our packaging. All of our packaging is recyclable, and our sustainable packaging manual will build sustainability considerations into future packaging redesigns. We recycle the majority of our manufacturing waste, and many of the waste by-products from our agricultural raw materials are used as animal feed or fertilizers.